One of the really cool features of the pick up was the unique fold down gates (aka "Dropside"). An innovative design, it allowed you to load the bed from any side of the vehicle and also carry items larger than the bed. The pick up has all the virtues and vices of the bus. It gets great gas mileage, is simple to work on and parts, at least the mechanical stuff, are plentiful. It's also ill handling, slow and rusts badly. 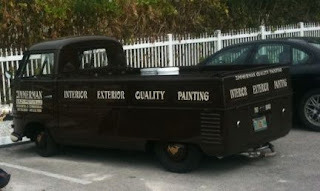 It's that last part that makes this 1969 pick up so impressive. Being a California car, it appears to be free of any serious rot. This is a well used SC. From the scrapes on the bed, it appears to have been used as a work vehicle. It needs paint and some minor bodywork. The interior could use some tidying. The seller includes no written description in the ad (we're left to guess as to whether it runs and drives), but leaves a phone number to call. These VWs are starting to increase in value. An older SC went for over $15,000.00 at a Christie's auction a few years ago. This one is priced at $6900.00. Located in Bellflower, CA, click here to see the Carsforsale.com listing. I've always thought these and the double cabs were really cool, but I had no idea that they'd trade hands in "average" condition for 7 grand. That seems like a lot to me, but in CA there's probably a hotter market for these. I figured a used but decent runner would be like 2-3k. Maybe this one's nicer than I'm giving it credit for, or I'm just toatally off my rocker. Hey Hoov - I thought the same thing. But, when I went looking for one to write about, I was amazed to find out how much decent ones were selling for. 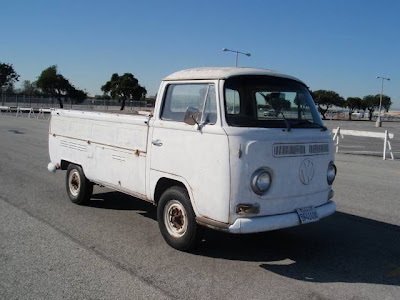 This one is on the high end of the price scale, but it was the best unrestored example I could find. I recently saw a pic of one of these VWs being used (when nearly new) by Pete Lovely to transport his Lotus type 49 formula one car. I will try to find the pic and send it along. Looks seriously overloaded, but the Lotus probably weighed about 1100 pounds. Funny you should post this... 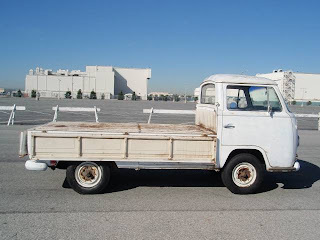 Lately I've been on a binge of looking up snub-nosed pickup trucks of the late 60's. The VW's are pretty nice, but it seems they've always been around as an offshoot of the 21 (or split) window bus community. Back in the late 80's I had an air cooled van with dual Solexes. The float needle valves often got stuck in the open position due to grit and resulted in fuel overflowing on a hot motor. I pulled the carb floats and blew out the valves so many times that I can still taste the gas. The gaskets were shot and replaced by chewing gum. The van finally ended up with one of those JC Whitney single carb setups with the obligatory exhaust kit. I think the Dodge A 100 series still look fresh, Ford Econolines less so. 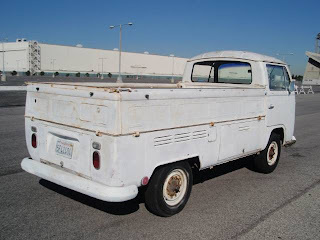 Those Corvair rampside boxes still look goofy. The Jeep Forward Control models are pretty neat and throw in the bonus of 4 wheel drive. Back in the 60's it seemed as if every gas station had one for plowing.